Ok. I'm playing catch up again. I had this post almost ready to go, when my battery died. It was really late,so I thought,forget it. I'll post it tomorrow! So here it is. 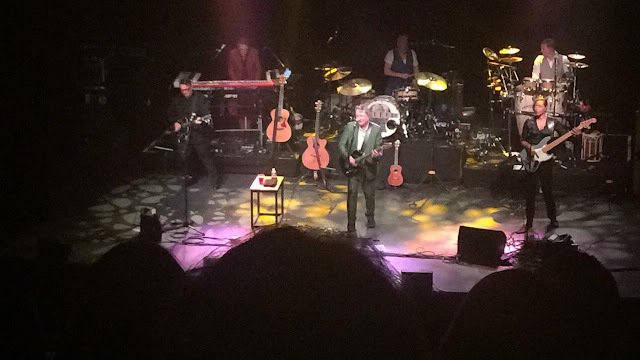 Well, the girls and I went to see Squeeze tonight. Today's doll is this beauty. She's just called 'The Witch on her original box. And she would have looked like this in her box. She's 'The Witch' from "Snow White". She was made by Bikin in 1988. She's obviously a cheap doll, but done pretty well. Look at her knobbly knuckles, just like in the movie. She looks kind of strange because she has a pale,witchy head, on a normal,pink coloured fashion doll body. Check out that nose wart. She has tiny little fashion doll feet with some black witch shoes. Don't ask me what the hunk of extra plastic on the back is. Maybe she's wearing spurs. She actually has a polyester dress on under that cloak. Although they should have tied it on the other side of her hand. 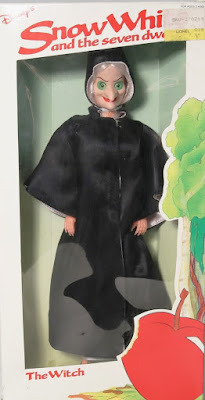 There were other dolls in this series of course,including Snow White,the Evil Queen, and the 7 Dwarves, if I remember correctly. Emma bought this one somewhere,at a yard sale probably. But I remember these dolls quite well. When Emma was tiny,(She was born in 1991.) there were still plenty of them sitting around in Toys R Us. Those were the days. the stores weren't in such a hurry to clearance things and get rid of them. Things lingered around for ages and there was always the chance you'd find something older and interesting. These days it's 'sell that thing or get it out of here'. See you tomorrow for Shrunken Saturday. I'm glad you had a good time at the concert. Yep, I live in Greater Cleveland, and it would be fun to meet up sometime in Akron or Cleveland or even the south side of Cleveland by I-71.